The region of Emilia-Romagna is home to sweeping farmlands and some of the best food in Italy: Prosciutto from Parma, culatello of Zibello, balsamic vinegar from Modena, the famous parmigiano reggiano cheese, and more kinds of salumi than you can count. It also happens to be home to dozens of castles, many of which are free or very cheap to enter. Here is a list of nine of the best castles, each paired with an excellent local restaurant so you can enjoy a long, leisurely meal after your visit. Looks good enough to be a book cover, doesn't it? This 12th century castle has huge towers that overlook the town and countryside. Access to many parts of the castle is unrestricted and unsupervised. Visitors with vertigo and/or claustrophobia might want to skip climbing the towers or checking out the dungeons, but there is still plenty to see. Its many rooms, decorated in 15th century style, are named according to the stunning, intricate artwork painted on their walls, like the Hound Room and the Lion & Leopard Room. Best of all, visiting this castle is totally free! For lunch, head next door to the casual, family-run Trattoria Bolognese, a favorite of the locals. Here you'll find the most authentic dishes of the region, prepared in the most traditional and delicious ways. The imposing Castle of Torrechiara dates from the 15th century, and is the most intact of the many castles of the Duchy of Parma and Piacenza. Just 30 minutes south of Parma, it makes a great hub from which to visit the region (there is a wonderful B&B right on the castle grounds). The castle, set up on a large hill, presides over the surrounding farmland. The castle itself is most remarkable for its rooms with frescoed walls and ceilings and paintings of fantastical and impossible creatures, called “grottesca”. For lunch, stay right within the castle walls and eat at Taverna di Castello. In warmer months there is patio seating outdoors. Be sure to try their “torta fritta” - deliciously salty, hollow puffed pockets of deep fried dough served with parmigiano reggiano and balsamic vinegar on the side, meant to be stuffed inside the pastry once you rip it open. The best “hot pocket” ever. 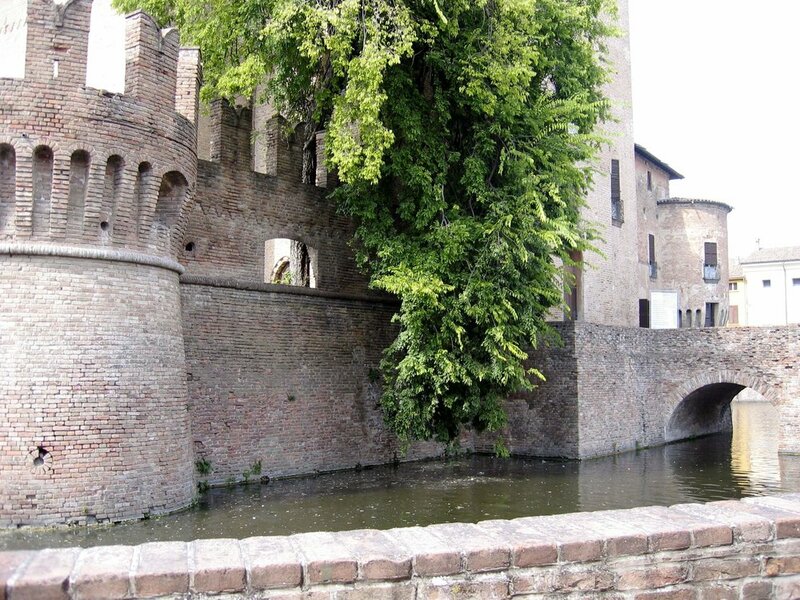 Another of the castles of the Duchy of Parma and Piacenza, Bardi is remarkable because it allows access to areas that would normally be closed to the public. A turn here or there in the building would lead you to dim, mysterious passages or to dank, rough-finished dungeon rooms. The castle towers watch over the town around every corner. The castle commands views of the mountainous Apennine countryside and the town of Bardi, which is visible from its several towers connected by covered rampart passageways. Rooms in the interior include medieval weapons of war and a torture chamber with frightening instruments of “interrogation”. Oh, and there’s also a ghost. Fresh strawberries and cream with pastry at Due Spade. Just a few steps away from the entrance to the castle, you’ll find the cozy little restaurant Le Due Spade. There is a small patio outdoors with a few tables; be sure to reserve one if you want to dine al fresco. The restaurant sources their food locally, and focuses on presenting traditional dishes of the region, specializing in mushrooms and truffles famous in the area. Technically part of the town of Vernasca (itself a very small town) in the hills, Vigoleno is a tiny walled castle town, halfway between Parma and Piacenza. The walls and other fortifications, dating as far back as the 10th century, are largely intact. Today the town boasts just 5 year-round residents. It is one of the most picturesque little medieval village towns in all of Italy; for this reason it is a popular site for weddings and other such events. Parking practically right outside of the town is free and easy; the walk through its cobbled streets could take mere minutes, but you should savor the experience and give it a good bit of time. Don't miss the small stores inside the walls, which sell local wines, liqueurs, soaps and crafts. A tour of the castle itself is well worth the small admission fee, which will also give you access to climb the tower; check out the prison room to make yourself grateful not to be on the wrong side of medieval justice. For lunch, try Bollicine & Tortafritta, located just outside the castle walls. The restaurant offers fantastic views of the castle from its patio, and the family here treats you to traditional, classic local cuisine. This castle is still lived-in today by the Landi family, who has had possession of it since the late 1200’s. Over the years the British royal family visited this castle often and their pictures can be found in many of the bedrooms. The castle houses the excellent museum of military uniforms and museum of the Battle of Levanto. Climb the unusually-shaped tower and you'll be rewarded with expansive views of the countryside. This castle also hosts a ghost, so be on the lookout for Giuseppe, the cook who haunts the kitchen. For lunch, treat yourself to the stellar restaurant Antica Locanda del Falco, which is right on the castle grounds. The restaurant is popular with locals, so it's best to make a reservation in advance. Don't miss the Locanda's incredible store next door, offering produce, oils, wine, liqueurs, pastas and more sourced from the area - plus an unusually large collection of Scottish whiskey. The castle is now a museum open to the public, and features a “camera obscura” in a room of one of its external towers. This device, through a series of mirrors and a prism, enabled the room’s occupant to view on a screen the activity happening out on the piazza – a prototype of today’s surveillance cameras. It is also one of the few castles left with an active moat. For lunch, walk across the street to the famous, traditional Locanda Nazionale; or take a short drive to Zibello to eat the best culatello in Italy at Trattoria La Buca. The culatello, made in house, is shaved paper-thin so it is translucent, then served with crusty bread and fresh butter, and in summer, with fresh peeled figs. Now in ghostly ruins, this 10th century castle was, among other things, the ancestral seat of the great noblewoman Matilda di Toscana. Matilda was one of the few medieval women to be known for her military accomplishments, which included holding the valley from this castle, situated on the top of a steep rocky hill. Note: The authors are not liable in the event of ghost encounters at this castle site. The turnoff to Canossa is easy to find, and the castle parking area is not far from the road, right by a ristorante/bar. The walk up is not terribly far, and it rewards you with panoramic views of the countryside in all directions. Explore the ruins, and check out the small museum inside the remains. For lunch, take a short drive to the tiny hamlet of Mazzalasino to eat at Ristorante Mazzalasino. This is a very casual restaurant, nothing fancy here, just good home cooking. There are no menus; they just come to your table and tell you what they have ready that day. It's like eating in your grandmother's kitchen - if your grandmother is an excellent traditional chef from Emilia-Romagna. Come hungry - the portions are huge. The central piazza, from the castle tower. This ancient hilltop castle town was built on the remnants of a Roman outpost, which overlooked the Val d’Arda river valley. It’s possible to climb to the top of the tower, which surveys this view beautifully. The current castle, the Rocca Viscontea, was built in the 14th century. Its decorative swallow-tailed crenellations are characteristic of this region of Italy, and are now home to hundreds of actual swallows, as well as pigeons and crows. The castle also houses an excellent Medieval Museum. Chef Eros sits with Matt after several glasses of "Rosolio". For lunch, walk across the piazza to the excellent restaurant Taverna del Falconiere, whose outdoor geranium-laden patio boasts very romantic views of the piazza, the castle, and the town below. Chef Eros makes everything from scratch and his wife Margherita gracefully handles the front of house. Don't miss Eros's homemade "Rosolio", a liqueur made from thousands of rose petals from his garden. The current castle walls and structures date from the late 1500s, though the site was a military stronghold for some 800 years before that. This strategic location was historically much fought-over by the conflicting forces of Modena and Bologna. The castle now houses several museum installations: The fascinating Museum of Mechanical Musical Instruments displays dozens of old musical devices from the 17th century onward, from chiming clocks to cranking music boxes to miniature automated pianolas. The Museum of Mountain Civilization contains tools, machinery, and other artifacts from ages past, giving an idea of what life was like in these highlands hundreds of years ago. A whole room is devoted to Teresina Burchi, a Sestola native who became a hugely successful opera star in the early 20th century - on display are many items from the costumes she wore in famous opera roles in Milan and elsewhere. But one of the best aspects of the castle is the stunning view it offers from the top of its tower over the town of Sestola and the valley below - you'll be greatly rewarded for all your climbing! Zeneba dressing the salad as the chicken waits. For lunch, head to Zocca and settle in for a meal at Osteria dal Cinon. Owned by the same family for generations, this Osteria prides itself on sourcing all its produce, meat, cheese and wine from local farms and producers. Everything is organic, fresh, and thoughtfully prepared. They also make a variety of fruit and herb liqueurs in-house, so be sure to save room after dessert to try a few. Or, let us plan a perfect Little Roads style trip for you - you'll eat the best food and stay in the most interesting places - including some of the above castles! That sounds cool - please plan my trip and send me to a castle!